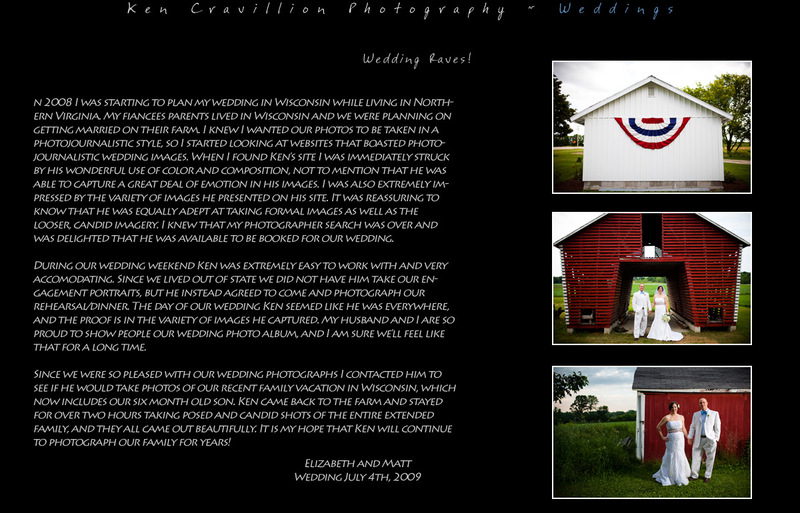 In 2008 I was starting to plan my wedding in Wisconsin while living in Northern Virginia. My fiancées parents lived in Wisconsin and we were planning on getting married on their farm. I knew I wanted our photos to be taken in a photojournalistic style, so I started looking at websites that boasted photojournalistic wedding images. When I found Ken's site I was immediately struck by his wonderful use of color and composition, not to mention that he was able to capture a great deal of emotion in his images. I was also extremely impressed by the variety of images he presented on his site. It was reassuring to know that he was equally adept at taking formal images as well as the looser, candid imagery. I knew that my photographer search was over and was delighted that he was available to be booked for our wedding. During our wedding weekend Ken was extremely easy to work with and very accommodating. Since we lived out of state we did not have him take our engagement portraits, but he instead agreed to come and photograph our rehearsal/dinner. The day of our wedding Ken seemed like he was everywhere, and the proof is in the variety of images he captured. My husband and I are so proud to show people our wedding photo album, and I am sure we'll feel like that for a long time. Since we were so pleased with our wedding photographs I contacted him to see if he would take photos of our recent family vacation in Wisconsin, which now includes our six month old son. Ken came back to the farm and stayed for over two hours taking posed and candid shots of the entire extended family, and they all came out beautifully. It is my hope that Ken will continue to photograph our family for years!